Each year, on 17th March, it seems every drokker and his robo-dog has some ancestral connection to the Emerald Isle. 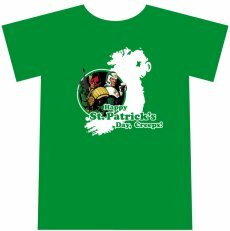 The Mighty Tharg would like to enrich your Celtic festivities this year by offering you this fine St Patrick's Day stout-cloth! At only Â£13.00 this zarjaz new T-shirt features the scrotnig artwork of top art-droid Steve Dillon. These are strictly limited and only on sale from www.2000adshop.com and various Forbidden Planet International outlets, so be sure to pick one up today to avoid disappointment.